Rožanski kukovi and Hajdučki kukovi are a unique combination of rocky peaks in the middle of Northern Velebit, and one of the most beautiful karst areas in our country. This picturesque karst spectacle created by nature in this place is protected as a strict nature reserve – an even stricter form of protection than the national park. In its essence, the area of Rožanski kukovi and Hajdučki kukovi is quite impassable and inaccessible. Due to the wilderness and inaccessibility, there are still places in this area where no man has gone before, giving these peaks a special aura of a pristine area. The well known pits of Lukina jama and Slovačka jama are located in the area of Hajdučki kukovi. These two pits are the only known pits in Croatia to exceed the depth of 1000 meters. Despite the harsh nature of the karst terrain and its impassability, the remarkable design quality of the Premužić Trail makes access to this stone heart of Velebit rather easy and pleasant for members of all generations. 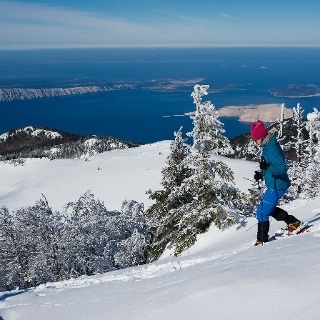 As a result, a walk through the area of Rožanski kukovi represents the most beautiful part of the longitudinal tour of Velebit, and also the most beautiful hiking excursion available in Croatia. The Premužić Trail is a longitudinal trail 57 kilometers long, connecting Zavižan and Baške Oštarije, passing through the most beautiful and inaccessible areas of Velebit, without any major climbs or descents. The trail was built in the period from 1930 until 1933, based on the design and under the supervision of forestry engineer Ante Premužić. The section of the Premužić Trail passing through the otherwise completely inaccessible karst terrain of Rožanski kukovi is particularly impressive – a true masterpiece of dry stone wall construction. On one rock next to the trail, at the beginning of Rožanski kukovi, there is a carved memorial inscription in honor of engineer Premužić. 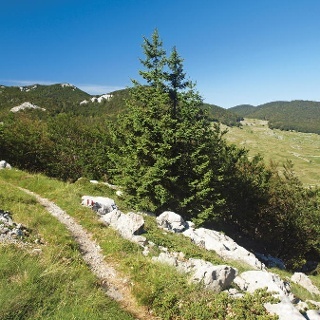 The construction of the trail was jointly funded by the Forestry Directorate of Sušak, the Croatian Mountaineering Association and the Royal Administration of the Sava Banate. Northern Velebit Nature Park administration has placed 26 information panels along the section of the Premužić Trail from Zavižan to Veliki Alan, with explanations of unique natural characteristics of the area that the trail is passing through. It takes 5 to 6 hours of hiking to pass the section from Zavižan to Alan. The route to the edge of Zavižanska kotlina leads along a road, and the Premužić Trail then proceeds from the road to the right, across a meadow. After passing through the forested area of Smrčeve doline, the Premužić Trail enters the rocky area of Rožanski kukovi. After one hour of hiking from the road, in the middle of a rocky amphitheater, there is a memorial inscription dedicated to Ante Premužić. In another 45 minutes of hiking, the trail passing through a landscape mix of forests and rocky terrain reaches the rocky base of the locality of Gromovača. Soon thereafter, we come across a trail branch ascending to the peak of Gromovača. 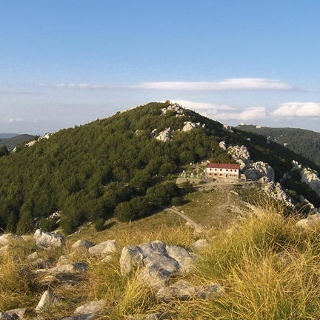 From the base of Gromovača, the trail mildly ascends to a small mountain pass (1620 m.a.s.l. ), which is also the highest point of the entire Premužić Trail. The trail then proceeds above a deep karst valley of Fabin dolac covered in grass. This is where we come across a trail branch to our left, leading to Tromeđa and Lubenovačka vrata. Soon after that, we reach the mountain shelter Rossijevo sklonište. After 40 minutes of hiking from Rossijevo sklonište, a gradual ascent takes us to a mountain pass between the eastern and the western peak of Crikvena. Immediately after passing the trail branch leading to the peak of Crikvena, the trail descends by approximately fifty meters along stone stairs and abandons the area of Rožanski kukovi as it enters the forest. The Premužić Trail then continues along the base of Goli vrh in a long bend (isohypse) and reaches a grassland pass between Seravski vrh and Goli vrh, with a beautiful view of Rožanski kukovi in the background. For the next one hour of hiking, the trail leads across undulating meadows and through occasional forest sections. As we approach Alančić, the Premužić Trail enters the forest, and, after a sharp left bend, reaches the transverse Velebit road Jablanac – Štirovača. After 300 meters of hiking down this road, we reach the Alan mountain hut. The markings in the forest also point to a quicker available shortcut to the Alan mountain hut. Easy to follow the trail! Rossiman hut is closed but the old couple running Alan hut are lovely. Drinking water, squat toilets, a warm room for drying clothes, 90 kuna for the night. Even without views it's great to be here! Alan had good soup, but bad service, really I did not feel welcome there.